Portly Porkers or Svelte Swine ? During the first year we had pigs and sheep, Val came for lunch one day and did a pre-prandial tour of our permaculture smallholding, pronouncing our pigs to be too fat and our sheep too thin. As beginners in animal husbandry, her expert opinion was helpful and we wormed our sheep and put them on better rations and made an unsuccessful attempt to thin down our portly porkers. 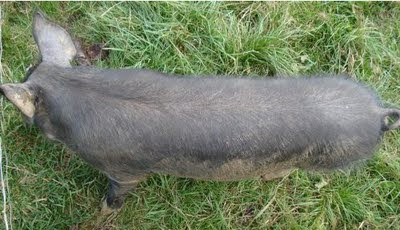 Now in our third year of pig keeping, we still value her advice but was not so sure that we are that far from where our pigs need to be, diet-wise and felt rather that the piggie pics were unflattering in a sort of “does this dress make my bum look big” sort of way. The last photo (reproduced here) shows one pig sat down, head scrunched up in the bucket, appearing to be a touch more tubby than in reality. I have therefore set myself the task of taking a more honest, flattering and stretched-out portrait to email to Val to ask her to review her opinion. The problem is that our pigs have been (unwittingly) conditioned to associate my presence with food, so they follow me closely with a certain loyalty/friendship/attentiveness meaning that I can’t easily get the side-on, stretched out shot I’m after. The dustbin containing their feed bucket was coming to the end and I had asked Paul, our neighbouring pig farmer for a refill. (I help him out with some occasional tractor driving and handle the English-speaking bookings for their gite; in return, Paul gives us all the grain we need for our animals.) When I went to collect the sacks, Paul told me that he’d been thinking about our pigs nutritional needs, as his are raised in concrete barns yet ours walk around on pasture, with access to plums, then apples and soon acorns. His has thus given us a “finishing” mix, less rich in nitrogen and protein but with more minerals. Paul has never kept Berkshires before but reckoned that they look about right; Val has. So, Val, and anybody else that has experience keeping Berkshires, please post a comment and tell us what you think of their shape. 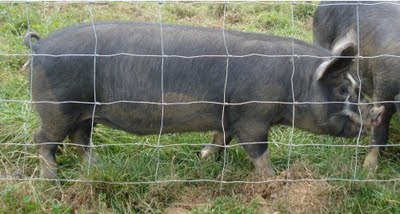 They are sixteen weeks old and, according to my pig tape, and weigh around 50 kilograms (110 lbs). 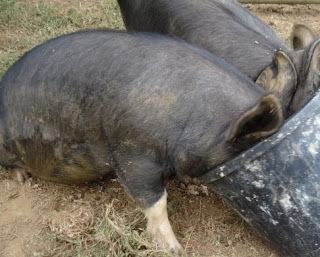 STOP PRESS : Have a look at the comments on my "how do you get two pigs in a bucket" blog to read some helpful expert advice from Stonehead, a breeder of Berkshires. Comparing them to to the auction catalogs I get from breeders, they may be a hair over, but they're not "portly." The lines look fairly sleek to my eye. And the key is while the animal is in motion, does it look athletic. Now a runner looks athletic, as does a defensive lineman, they're just different types of athletic. Same for pigs. Yep I agree with Albet! from the side and above they are looking a little over....the sat down pic did them no favours!!! Watching them run is a good way of assessing too as you are looking for sleek and fit with no wobble!! You should also be able to feel ribs if you push hard at the sides and that will give an indication of back fat. I was going to ask you about the mixes that you get as we feed weaner until about 10 weeks then grower then finisher.....supplimented with veg etc. With a Berkshire keep an eye on the shoulders and kill before they get too big....to kill out at 60kg max is the aim, many berkshire breeders go for 55kg. The trick is to get them to that weight slowly for maximum taste! Now this is only my opinion and there are many other opinions, none wrong!